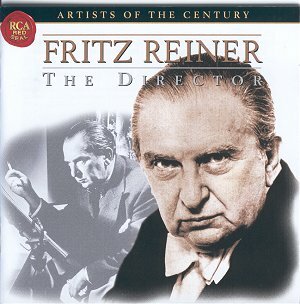 The collaboration of Fritz Reiner and the Chicago Symphony Orchestra was a particularly successful phase of the orchestra's history, and their recordings together constitute an important legacy of great performances. Reiner was one of the finest conductors of the middle years of the century. He died in 1962, soon after retiring through ill health from his post as Principal Conductor in Chicago. Together they made many notable recordings, which have only fitfully been available on this side of the Atlantic. For all these reasons this 2CD set is particularly to be welcomed, but in addition the quality of the digital remastering is exceptional, and has breathed new life into everything on the programme. Certainly congratulations are due to the recording engineer, Andreas Torkler, for the vivid, clear sound allows many details to be heard and the vitality of the performances to be fully appreciated. Above all Reiner was an orchestral disciplinarian, a man who believed that only the highest standards of technique and application could bring the highest standards of music making. And it shows, not least in the opening section of Rossini's Thieving Magpie Overture, in which the attention to detail in matters of dynamics brings maximum rewards. The music communicates with the utmost directness, and only in the loss of clarity in fully scored climaxes does the sound become congested. This caveat is not a major problem, and you could not wish to hear a more exciting performance than this. The same is true of Haydn's Symphony No. 88, the well chosen tempi and tightly controlled ensemble combining to make the performance really compelling. The Beethoven symphony included here is the Seventh, and the music's directness and rhythmic vitality suit Reiner's strengths as an interpreter. The first movement's introduction generates enormous tension, which is released in the surging Vivace. While this is not wanting in power, the balance favours the strings, and the exuberant horns are not always clearly heard to full effect. I fancy this results from the original recording, though it is possible that Reiner simply felt the music that way. There are no doubts about the remainder of the performance, however, and the second movement Allegretto is particularly successful, with some magnificently sonorous climaxes. CD1 concludes with Berlioz's orchestration of Weber's piano piece, Invitation to the Dance. The release of the exuberant principal theme is most exciting, the performance very direct and strong, though the recording does not allow all the subtleties of the scoring to make their full impression. Reiner loved the world of Viennese waltzes, recording a notable LP of music by the Strauss family. The Emperor Waltz is represented here, one of the largest and most ambitious among Strauss's compositions. The playing is brilliant, and the music's title is justified by an interpretation which lacks nothing in weight and power. Willi Boskovsky might have rendered the music with more charm than Reiner, but the latter's symphonic view is valid also. Likewise the vitality of Liszt's Mephisto Waltz is the priority of this powerful interpretation. The inset notes do not tell us the arranger of this version of the Suite from Wagner's Mastersingers: Prelude to Act III, followed by Dance of the Apprentices and Entry of the Masters. Presumably it is Reiner's own. Be that as it may, it works supremely well, and the playing is astonishingly good. The brass players in particular excel themselves in the sonorous nobility of the Act III Prelude, which is a real highlight among these performances. Dating from 1954, Strauss's Don Juan is the earliest of these recordings, and sonically it shows its age slightly more than the other performances. That said, the sound remains acceptable, though the great moment of the horn call, around which the piece surely centres, misses the mark because there is little bloom in the sound until the strings take the music on. Reiner's interpretation is intensely involving and keenly paced. There is superb playing on display also in the remaining items in the collection: Ravel's Rapsodie Espagnole and Bartók's Hungarian Sketches. The latter take just a few seconds to impose their composer's strong personality, and Reiner's affinity with his countryman is clear in every bar. The Ravel is given a performance which brings out the music's divergent characteristics: a languorous, exotic atmosphere at one extreme, and tight rhythmic intensity at the other. And the whole work is held together by a disciplined vision of the larger scale of the work. In fact the performance of the Rapsodie Espagnole is typical of the music-making which runs through the whole performance: imaginative interpretations founded upon an iron discipline.